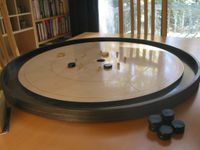 After reading so much about Crokinole on BoardGameGeek, I finally decided that I had to have it. I read countless threads to research where to purchase a high quality board, and came up with a list of four possibilities. There's Wayne Kelly's (a.k.a. 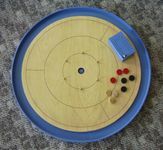 Mr. Crokinole) boards available at http://www.crokinole.com/. 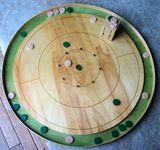 There's Willard's boards available at http://www.crokinolegame.ca/. There's Miracle Venture's boards available at http://www.miracleventures.ca/. Finally, there's Carl and Stan Hilinski's boards available at http://www.crokinoleworld.com/. 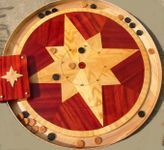 While all four retailers had received high praise on BGG, I finally settled on a Hilinski board because the idea of owning a unique one-of-a-kind board was just too great too pass up. 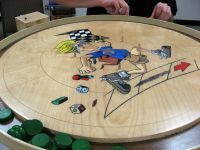 I not only really liked the slideshow of past boards created by the Hilinski brothers, but I also liked the attitude of their website, about how they make boards for fun. I decided that I really wanted to patronize their business, and am glad that I did. I opened my new Hilinski board on Christmas morning, and despite my exceedingly high expectations, it has surpassed everything I hoped for. I've played it an astounding 42 times in the 20 days since I got it, and absolutely everyone I've introduced to the game has loved it. The Hilinski boards truly are works of art, rather than merely a game, and I'm currently figuring out where to hang my board on the wall. Here is a list of all of the photographs from the BGG image gallery that are identified as Hilinski boards in their captions, including the photo of the board, name of the board, and the owner. Please feel free to add any that I may have missed. I obviously really like my board. It's American cherry stain on birch, with a black cherry stained ditch, and a chrome center. I had trouble deciding if I would rather have a dark playing surface with a lighter ditch, or a light playing surface with a darker ditch, and ended up deciding on the latter as you can see. I also like the relatively plain center. While I think some of the pieces that the Hilinski brothers use for centers are really innovative and interesting, I'm glad to have something clean and simple. I'm now in the process of figuring out where to hang my board on the wall so it can serve as both a great game and nice decoration in one. Favre's Adulation is walnut burl on an oak ditch. 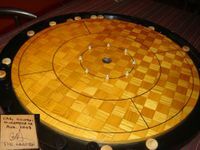 I think the playing surface of Adulation may be the most gorgeous Crokinole board I've ever seen personally. I know that everyone has different tastes, and this board is obviously the inverse of mine so it's strange that I like both so much, but I can imagine just staring at this board for hours, getting lost in it. In contrast the dark and textured surface of Adulation, I'm also really fond of the really clean look of Almost Home. The surface might look plain to some, but I think of it more as pure. It looks very slick, and I think the very dark ditch really complements the board very well. Ahh, Northstar! The image of this board is burned into my brain after seeing it on here so many times. It's got to the ideal that other boards are compared to in many ways. I'm not sure how distracting the star would be to actually play on, but I do know that it sure does look fantastic. It does also look very functional, as if it would work well for gameplay too, but even if this had to just sit on my wall, I know I'd be happy (as long as I had another board to actually play on). 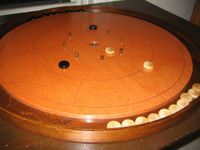 Raindrop is the only three-player board I've ever seen. It's natural maple with a blue ditch, and only 6 pegs instead of the usual 8. While all of the Hilinski boards are unique, Raindrop is truly unique, as far as I've seen. 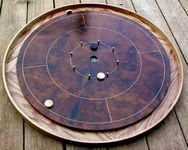 I do enjoy playing 3-player on my board, just having 2 on a team against the other one, but this board would make 3-player even more fun. 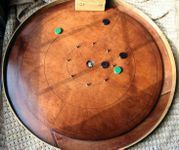 I can't believe that on person (Joe Casadonte) actually owns two of the best looking and most unique Crokinole boards I've ever seen photos of. Frenzy is Birch with a Candlelight stain and a Brass center. This is the board that most reminds me of my board, and for that reason, I obviously think it looks great. The colors are very warm, and I have a feeling they'd go well with the furniture in the living room where it's likely stored, complementing the coffee table or entertainment center well. Tom Hancock's board is on of the most striking I've seen. The impressive colors have definitely got to grab the attention of any passers-by during a game. I'm not sure if it's the type of board I'd personally want to have for myself, but I'd definitely like to have a friend with Surveil so that I could play on it any time I wanted. Homefield Advantage is the first of two Hilinski brother boards owned by user deacondavid. As you can see, this is another really interesting and different board, but in a very different way than Surveil. I like the concept, and I also like the use of the metal posts to complement the green surface. This is another board that I may not want to buy for myself, but would definitely like to know someone who had it so I could give it a try sometime. I think it says a lot that 4 of the 12 boards on this list are owned in pairs by the same people. Joe Casadonte was obviously willing to shell out the big bucks again to pick up not only Northstar, but also Raindrop, and deacondavid also returned to the Hilsinki well to add Glide to his collection along with Homefield Advantage. They're clearly making a fantastic product if they're able to drum up repeat business in a field where repeat business is probably far from the norm, what with the cost and lifespan of these boards. 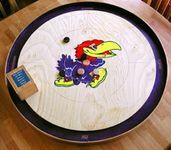 Thunder is another nice warm colored board like Frenzy that I think would go great with most living rooms as a fun game and a piece of furniture, as the Hilinski brothers refer to their boards on their website. 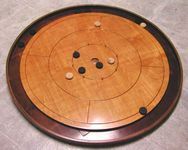 I'm just guessing that this board is owned by Aldie, can anyone confirm? I know a board with this image was available for everyone to try at BGG.CON, and it was partly as a result of hearing all the stories of people having fun discovering the game at the convention that inspired me to get a board for myself. 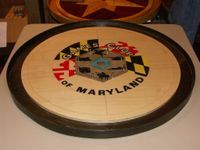 From the photos it looked like the BGG logo on this Crokinole board turned out great, I'd love to see it sometime. I wasn't able to find the name of this board, but I do like the look of the faded colors. The Hilinski brothers actually seem to make a surprising number of boards with green as the dominant color, which isn't something I would have thought would be common and isn't necessarily something I'd want for myself, but some of them turn out surprisingly well. There were actually a couple boards with a green ditch available when I got my Cimarron, and I can't say I wasn't intrigued by the prospect, but I guess I wasn't daring enough in the end to get something with color. Antique pine stain on maple. Wood pegs are painted gold. This is my personal board and have owned it well over a year now and have never regretted purchasing it. Surprisngly, the center is NOT "red glass" as you might expect. 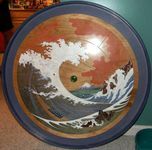 It is a disc of brilliantly stained hard wood. This is my second Hilinski board. I first owned Frenzy, which I ended up selling to a person way out in the hinterlands of Newfoundland just before Christmas. 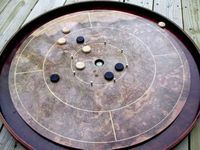 While Frenzy was a GREAT board, super slick and accurate, the off-center seam between the birch plywood pieces on the playing surface bugged me. I wouldn't have minded had it run right down the middle, but I guess I just couldn't live with it being off-center. When I saw Red Coat on the Hilinski site I couldn't resist. I love the antique look and the totally uniform surface was exactly what I was looking for. In the photo, the dark section in the upper left is just a reflection. The actual surface appears to be one, highly uniform piece of wood. I was surprised, however, to find that Red Coat plays very differently from Frenzy. The surface is much slower and less accurate. It is MUCH harder to hit 20s on Red Coat. I actually don't mind, as this assists in leveling the playing field between beginner and experienced player. It makes the game more fun in a game group setting, because the beginner is not completely getting destroyed. Met Stan at Euroquest just a few months ago. 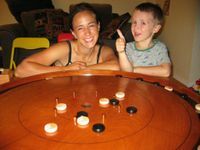 Played Crokinole for the first time and bought this board just a few weeks later. The people who've played on it have been asking me where to buy it. Referrals are coming and are well worth it. Here's ours. It was named "Swampfox" and I bought it as a birthday present for my husband a little over two years ago. Our house got broken into a few days after it arrived, but luckily I'd hidden it in a corner and hadn't unpacked it. Another present got stolen, but this one was left behind. Dynasty was painted by Penny Haufe to match Ipecac's Japanese-themed game room. And, yes, that is Northstar in the background. I picked up Mojimbo from the Hilinskis almost two years ago. I loved the cherry stain, and it fits my more modern tastes pretty well. Even with the $150 price tag, it's one of the best gaming investments I've made! Purpleheart on satinwood field (veneers). Knob center, chrome posts, black ditch and rails. Since this list was instrumental in my acquiring a Hinlinski board (I have a post at the end of this list), I figured it was appropriate to actually post the board here now that it has finally arrived. My wife is my most constant gaming companion, and we will celebrate our tenth anniversary later this year. I wanted to do something game related and special to honor that milestone. For this reason, I wanted a board with the yellow and purple motif -- these were our wedding colors after all. 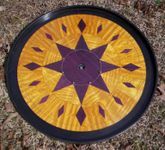 In my initial inquiry, I asked about the possible use of purpleheart, a favorite for each of us. After several emails, we came to an agreement on how we could do the purpleheart and a rough idea of the final design. 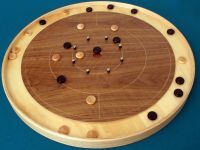 When I saw a picture of the final board, I was stunned. It was absolutely wonderful. When it arrived earlier today, my wife was equally impressed and immediately approved my idea to hang it in our dining room. Here is my new board: Sandstorm. I got the chance to play on Dark Dreams and it was all I needed to take the plunge and pick one of these up. One other thing I note about my board is that it seems to be one of the only ones that has rubber around the posts instead of just the bare metal. I see that the Teardrop above does the same, but all of the other boards in this gallery have bare metal posts. After playing on boards with both, I don't see too much difference in the rubber vs. the bare metal, except perhaps there isn't a "chunk" when the carroms hit the posts. Perhaps there is a slight bit more springy action as well. 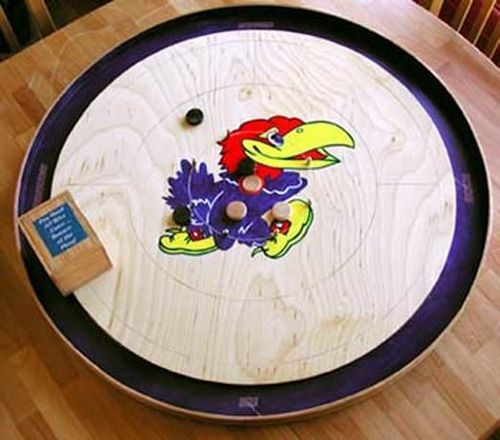 Four words are printed in the ditch - "Rock" "Chalk" "Jayhawk" "KU"
The box has a label that mimics a sign that hangs permanently in the rafters in the Fieldhouse in Lawrence. It reads, "Pay heed all who enter - Beware of the Phog!" 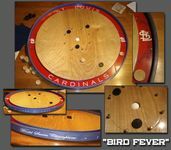 "Bird Fever" This is my Hilinski board I just received. I put all of the graphics on it, but the board itself really is beautiful. I have a lot of Cardinal decorations in my office and this looks great hanging on my wall. Notice the baseball in the 20 hole.